Time to ‘fess up. I’ve been horribly, horribly wrong on gold. So much so that now I’m afraid of being labeled a contrarian indicator! 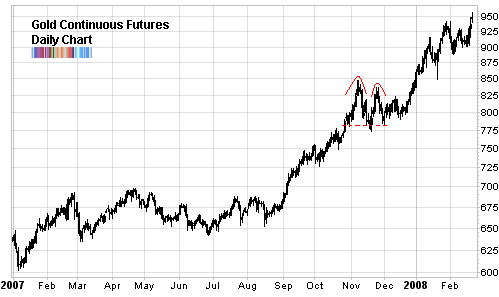 To be fair, a double top formation is only triggered when the neckline (the dotted line on the graph above) is pierced. Since that didn’t happen, we didn’t officially have a double top, at least according to the widely accepted definition within technical analysis. That doesn’t absolve me as I’ve been skeptical of a continuing gold bull market. And I’ve been wrong, wrong, wrong. Gold’s climb has been unrelenting. Just today it closed at $949.20 on the Merc, taking it within a nugget’s throw of $1000. But while the price of the commodity is 12% above the swing high in November 2007, gold stocks - as measured by the Gold Bugs Index - are barely peeking above those levels. So if you’ve owned any gold equity, instead of the metal itself, you’ve lost out on a lot of money. Since the k-ratio has entered a channel, the easiest strategy is to buy gold stocks only when it approaches the “floor” and to sell them when it hits the “ceiling”. I’m hesitant to venture into any trades with a longer time frame since I’ve been clearly off my game on this sector. I think my mistake was that I used the k-ratio’s valuation message to mean that gold’s trend couldn’t continue. Boy have I been schooled. The valuation is still high - historically - but that doesn’t mean that a trend can’t continue. The k-ratio is an amazing tool but it is really useful in giving you the really big picture. For anything more granular it falls apart. Surprisingly, the rise we’ve seen in the price of gold has been against the headwinds of seasonal patterns. Historically, the period of time from the end a year to the end of March of the next year has been a very bad time to be long gold. It is exceptions to such seasonality “rules” that remind you that the market doesn’t have to follow any dictates, no matter how well founded. In case you’re wondering, the best time in the calendar to go long gold is at the end of August and into October. Traditionally, this short time frame has provided the biggest boost to the price of gold. But right now the summer is way too far away for me to use it to place any bets. Finally, as an attempt to peer into the fog of future prices, lets do a quick review of the current breadth in the gold sector. Almost 86% of the gold stocks that comprise the sector are trading above their 200 moving average. Since this is a strong bull market, the percent of stocks above their long term moving averages has been consistently high with only a few short blips lower. 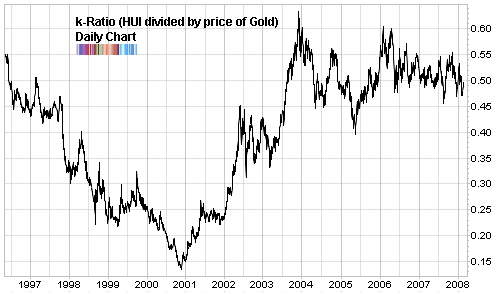 In January it even reached the rare maximum: 100% - around the time that the Gold Bugs Index (HUI) topped out at ~480. This statistic tells me that if I want to go long gold stocks for an intermediate time frame trade, this isn’t it. Not even close. Thanks to today’s strong close, 100% of the gold stocks in the sector are trading above their 10 day moving average. At the beginning of the month, that number was less than 10% - so again, this is not a good time to go long, even for a short swing trade. The best combination of breadth is strong long term (200 day average) and weak short term (10 and 50 day moving average). A good example was in mid December 2007 when there were only 10% trading above their 50 day MA and 5% above their 10 day MA with a very high 60% above their 200 day MA. I’m keeping a wary eye on this sector until it presents a similar setup and will post about it. I’ve always felt a certain perma bull in you. However, you couldn’t be a very biased person if you admit when you are wrong. Actually only good investors admit they are wrong. Kudos to you for not hoping and praying. You are a very smart trader.I don’t need to look at track record to know that.Do u trade independently or work for any hedge fund.Do u trade full time or part time?